Essential reading: What makes a picture book a classic? Anyone who has ever loved a picture book knows how much they matter. They make sense of the world, even as they rearrange it with flying beds and tigers at the dinner table. They feed a child’s imagination. They delight and scare and comfort. They create readers. And some, because of the worlds they bring into being, or by an alchemy of voice and story, lodge in a child’s memory so deeply that they never really leave. To read the rest of this article, visit The Monthly. Thanks to @OzKidsYALit for the link. Posted in Australian Children's Literature, Learning and teaching, School Library stuff | Tagged: Lisa Clausen, The Art of Children's Literature What makes a picture book a classic | Comments Off on Essential reading: What makes a picture book a classic? That’s a Kaurna translation of a contemporary greeting now used in Pitjantjatjara and other Aboriginal languages, and it’s my introduction to learning the Kaurna language of the Adelaide Plains in South Australia. It’s long been a concern of mine that although I can fudge my way around in Europe with a smattering of languages, I don’t even know how to say thank you in any of the indigenous languages of my own country. There is no better way to understand another’s culture than to learn a bit of their language, and that is why I am so delighted that Wakefield Press has sent me this book. It is a beautiful, enticing, brightly-coloured book on glossy paper with lots of illustrations to complement the lessons, but it begins in a way that no other ‘teach yourself a language’ text does. In the preface there are 23 profiles of the people who contributed to this book, making the salient point that like nearly all Aboriginal languages the Kaurna language has been put at risk by a combination of factors arising from the colonisation of the continent by the British. In different ways and coming from different starting points, these profiles confirm what I already knew from talking to award-winning indigenous author Kim Scott, that the resurrection of these languages is difficult when so many indigenous Australians – whose birthright these languages are – were severed from their families, their culture and their language under Stolen Generation policies. That is why a book like this is so important. My next stumble came with the word ‘thank you’. The text explains that Aboriginal languages didn’t have words for thanking people because in pre-colonial times people did things for others either because they were obliged to under kinship rules or because they wanted to. Indigenous Australians don’t expect to be thanked; what is more likely is an expression of affection such as Ngaityo yungandalya (My brother!) or Ngaityu yakanantalya (My sister!) Ngaityalya (My dear!) can be used for anyone regardless of age, gender or relationship to the speaker. This last form is an example of the way indigenous languages have adapted to contemporary needs. The suffix -alya on the end, is explained in a little grammar box on the side of the text: it expresses endearment. How nice to have a language grammar which expresses endearment! The only equivalent I can think of in English is adding -kin/s to the end of a word, as in lambkin, or using it to add to the name of my grandniece, as in Poppykins. I have a feeling that my use of this suffix -kin betrays either my age or my origins! I’m intrigued by the two long sections about Talking about Space and Time, because I already know from teaching indigenous children that their concepts about this are entirely different to ours, and I’m also keen to explore the differences between Talking with Children, and Talking with Elders. 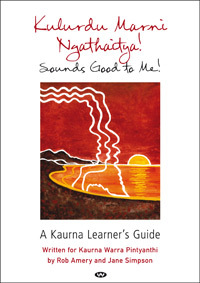 The book is designed for people who are teaching Kaurna and assumes no knowledge of the language or even the culture: apart from the easy-to-understand lessons which are based on a communicative approach there are posters at the back (which can also be ordered from the creators). Awakening a sleeping beauty tongue is a remarkable achievement of ethical, aesthetic and utilitarian significance. This textbook is an exquisite contribution to Revivalistics, a new field emerging in the wake of greater concern about intangible heritage, intellectual sovereignty, human wellbeing and social justice. Professor Ghil’ad Zuckerman, chair of Linguistics and Endangered Languages, University of Adelaide. Or direct from Wakefield Press. Years ago, one of my son’s favourite books was one about a man who lived in a drab suburban street where there was no sense of community. I can’t remember its name, but I remember the story well: one day this man took it into his head to decorate in house in a strikingly original way. Before long the neighbours were all friends, and the street was transformed into a riot of colour. Well, The Spotty Dotty Lady is in the same tradition, brought beautifully to life for the 21st century by the stunning artwork of Fern Martins. The Spotty Dotty lady, who at the beginning of the story has no name, is a lonely woman ‘whose only friends were the pretty flowers in her garden’. One day she discovers a new plant that has mysteriously arrived in this garden, and she nurtures the bud until it blooms into a spotty dotty flower. When more flowers bloom, she paints her old weatherboard house with dots, and before long the neighbours are outside wanting her to paint their tea cups. They christen her with her new name and her loneliness vanishes when she throws a party and the street is filled with music and dance. The book ends with a wise old owl that must have dropped the seed flying away over a neighbourhood that is ‘the happiest street in the whole town’. It is a simple story that celebrates the way that gardens can bring people together. It also encourages young readers to be themselves, and to enjoy odd or eccentric things if they like. The illustrations are just gorgeous. The dots, of course, reference Aboriginal dot painting, but the characters are multi-ethnic, and the setting is urban. I particularly like the realism of the womanly shape of the spotty dotty lady, and I love the retro feel of the canisters and the radio in her kitchen. I think art teachers would love the inspiration this book offers for decorating all kinds of things – the spotty dotty lady even has spots on her teeth! Like all good books by indigenous artists and authors, The Spotty Dotty Lady includes information about the indigenous heritage of Josie Boyle and Fern Martins, and I recommend the use of an Aboriginal Australia Wall Map to locate their country when introducing the book. (I have mine on permanent display). This quick and simple act of recognition is a powerful way to remind students of the diversity and longevity of Aboriginal culture and its storytelling heritage, and the cumulative effect of reading stories from all over Australia enriches their pride in our country as preeminent in the field of children’s literature. Josie Wowolla Boyle is a Wonghi woman who was born in the desert of Western Australia. She is an acclaimed storyteller, singer and artist who has been enchanting children of all ages since the 1980s. Josie performs in primary, secondary and tertiary institutions. She has made a number of recordings, worked as an artist in residence and featured on ABC’s 5 Nations’ Dreaming stories. She is also a regular presenter in literature and music festivals across WA. In 2012, Josie published her first children’s book, Bubbay: A Christmas Adventure with Magabala Books. (Click the link to see my review). Fern Martins is an Ngarabul woman from New South Wales. She launched her career at the age of 19 with a one-woman sculptural exhibition and has developed her career as a sculptor, printmaker and artist. In 1988, together with other young Aboriginal urban artists, Fern started Boomalli, the Sydney Aboriginal Artists Cooperative. She has exhibited at the National Gallery and has lectured at the University of Adelaide. The Spotty Dotty Lady would be a great book to use as a catalyst for ‘getting to know you’ activities at the start of the year. This is an exceptionally good article by Dean Ashenden at Inside Story. Highly effective teaching is hard to do, hard to learn, and hard to find. It is exceptional. The proposition that we can make classroom maestros the rule rather than the exception by tinkering with pay structures, teacher education, bonus schemes and the like is implausible.